Chomp Casino will then reward you with a bonus (Welcome Bonus is for new players only). The terms and conditions of the bonuses vary between different casinos and might also change over time and between different countries, so it is important to compare the different offers and read the T&C for Chomp Casino before signing up. Launched in 2011, Chomp Casino is a member of Nektan Limited, a renowned operator that powers more than 45 online casinos. Chomp focuses on UK-based players and holds a license issued by UK Gambling Commissions, authorizing the operator to provide legal services to the members that reside in the United Kingdom. Those outside the area will be under the jurisdiction of the Gibraltar Government. 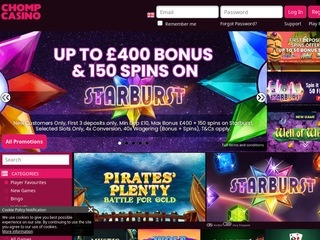 As an instant-play casino, Chomp can be launched on one’s desktop or mobile device, with an instant access to the latest releases by the top-notch software developers: Microgaming, NetEnt, Evolution, Red Tiger, and others. Apart from hosting Nektan’s in-house produced games, such as Mayan Marvels, Mayan Gold, Cave Raiders, and a couple of virtual casino tables, Chomp Casino has an extensive list of releases provided by more than 20 software developers. Due to the impressive selection of slots, casino games, live dealer tables, and progressives, Chomp employs an advanced filtering system that enables the players to filter the offer according to the providers, popularity, or the type of wins and hit frequency: Big, Regular, Frequent… The latest releases can be found under “New Games” while the games with the highest popularity ranking are flagged as hot. All titles (except for the ones stored under Live Casino section) can be launched in demo-play with an option to switch to real money wagering placed at the bottom of the gaming screen. Slots are not limited to a single category. Releases with a progressive payout are grouped under the Jackpot section featuring Mega Moolah, Divine Fortune, Treasure Nile, Major Millions, and a number of other titles with a life-changing payout potential. The offer is continuously updated to include the latest and the most popular new releases, which does not mean that the players will be deprived of iconic editions such as Gonzo’s Quest, Starburst, Taco Brothers, and others. Casino Games at Chomp Casino come in two different forms – virtual and live. The virtual tables are provided by Nektan, NetEnt, and Realistic Games, and the players can open them in practice-play or start by submitting the real money wagers. Table Limits will be displayed before you even launch the game, and the offer includes Blackjack (with or without the side bets, Hi-Lo, Classic Professional, and European), Roulette, Oasis Poker, Texas Holdem, Punto Banco, and Pontoon. The majority of online casinos store their Keno, Bingo, and other types of special games under a separate category that’s usually named “Others”. In Chomp Casino, games that could not find their spot in any of the other main categories can be located in the Instant Win section. Big Money Slingo Bonus, Wheel of Fortune, Spinlotto, Crossword Cash, and Foxin’ Wins Scratch are some of the releases that players can try when making a break from slots and casino tables. Nektan powered casinos are known for their exceptional selection of Live Tables, which are supplied by one of the best software developers in the business – Evolution Gaming. Those who haven’t had the opportunity to test their software are in for a treat. A sophisticated platform, great visual quality, and professional dealers are among many advantages offered by this provider and all those who complete the registration process and place the deposit can join one of the tables inside Chomp’s Live Casino lobby. Some of the most popular tables are Immersive Roulette, Auto Roulette, Speed Roulette, Double Ball, Blackjack Party, and Baccarat. In case you ever get tired of Roulette and Blackjack, Three Card Poker, Casino Holdem and Dream Catcher wheel are available as well. 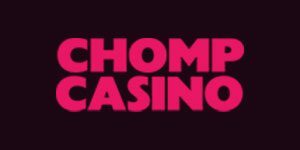 When it comes to payment methods accepted by Chomp Casino, the registered members will probably be quite pleased with the selection. Deposits can be placed through a wide range of services including PayPal, Neteller, Boku, Paysafecard, Skrill, Visa, Maestro, MasterCard, Trustly, Zimpler, and many others. All the payments are safely processed and the casino meets the security requirements set by the e-wallet service providers and card issuers. The minimum deposit that can be submitted is $10 ($15, if you are using Boku – this service also include a 15% fee). The limits can also be adjusted by the players and the maximum amount that you can transfer to your casino cashier will depend on the selected payment channel. Withdrawals are capped at $2,000 and the requests are processed within 72 hours. Casino representatives are available via phone, email, and Live Chat. If you would rather talk to someone or if you have a pressing issue that needs urgent attention, Chat and Phone support would probably be the best option. Live support can be reached every day from 08.00 to 00.00 GMT/BST zone and the email address is [email protected] Both the response time and the efficiency of casino representatives are rated very highly.